Janie De Coster: My inspiration comes from real-life experiences as well as what’s in today’s media. JP: What sets What My Sister Didn’t Know apart from other books in the same genre? JD: I try to make my characters as real as the person reading the book. I give characters real lives and problems to which my readers can relate. I don’t want to just tell a story. I want my readers to feel the story and be able to walk in the character’s shoes. JP: As an author, what are the keys to your success that led to What My Sister Didn’t Know getting out to the public? JD: The keys to my success has been my support system. My family is my rock. They have helped me from day one in this journey. Even my grandchildren pitched in with promoting of What My Sister Didn’t Know. I must give a shout out to my friends and co-workers who have been my one of my biggest fans. JP: As an author, what is your writing process? How long did it take you to start and finish What My Sister Didn’t Know? JD: My writing process starts with me rising early on Saturday mornings when all is quiet in my house. I can get quite a few chapters done with a cup of coffee by my side. It took me about nine months to write What My Sister Don’t Know. JP: What’s next for Janie De Coster? JD: I have another novel called Broken Commandments with Parker Publishing coming out in November of this year. I like books where I can relate to at least one of the character because they are believable. Nice interview. I also like books that you can put yourself on the page and follow along like you are actually that person, and sometimes you find yourself being more then the one character, not that you are bi-polar or anything , but sometimes you have either done something and changed to the other person or it can be a help book to help you change to the other character. 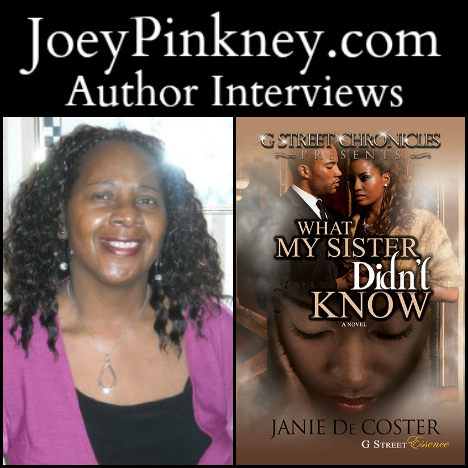 ONE of the first five people to comment on Janie De Coster’s author interview will win a free copy of What My Sister Don’t Know. Here is the list of people who are in the running for a FREE copy of the book. Leave a comment about your thoughts on the interview. ONE of the first FIVE people to comment will win a FREE copy of this book. This was a nice interview. What My Sister Don’t Know sounds like an interesting read. I think this is a very intersting book to read, also. Full of drama, but not over the top. Nice interview! Its great that you write to relate your readers! I look forward to reading your book! God bless! I like that she isn’t afraid to take the reader and guide them through the twists of the characters’ minds. If I don’t win….. where can I buy this book? You can buy this book by clicking on the picture of her and her book cover, at the top of this interview. I am intrigued by this interview, looking forward to reading What My Sister Don’t Know. LOL, busier than ever, huh? Thank you Ms. Dukes for stopping by and updating me.